President Trump has repeatedly criticized two men this week: George Conway and John McCain. The latter can't respond, but the former has been trading insults with the president. It's made life all very awkward for White House counselor Kellyanne Conway, who is now having to respond to the public feud. She admitted her husband was the one who started it. In recent days, he started accusing Trump of being mentally unfit and Kellyanne said of course he had a right to respond. Conway offered more thoughts on the feud in an interview with Maria Bartiromo on Fox News Business Thursday morning. She was as surprised as anyone. 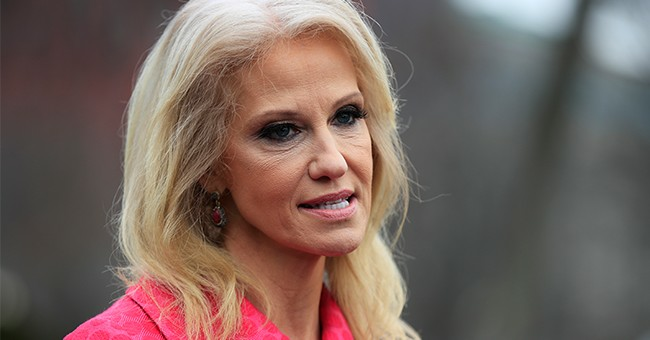 “My husband has been very critical of the president publicly, which is unlike him because he’s traditionally been a very private person,” Conway noted. For a man who sent zero tweets in 2016, it’s surprising to see him suddenly publish things like this. What also is new, Kellyanne said, is her husband "not supporting the agenda of the president and my work there." For, when George took himself out of contention for a DOJ job, he put out a public statement noting that he nevertheless supported the administration. She recalled how George was initially "excited" to move to D.C. with their four children, and how they mutually decided against both of them having a job in the federal government. Her husband has called for her to leave the Trump White House, but she said that won't send a good message to feminists. She "appreciated" the president protecting her and explained he has never pressured her to choose between her personal and professional life. She also condemned journalists who apparently consider themselves, “self-designated marriage experts.” They are getting into "dangerous territory," she warned.